Last time you purchased a new pair of glasses, how much thought did you put into the actual lenses? You had your eye exam, you looked over the various frame options but you most likely did not consider whether or not your lenses were high index or not. In fact, you may not have even heard of the high index option. However, high index lenses have many benefits and are even recommended for certain glasses wearers such as those with a stronger prescription. If you have never heard of high index lenses or about any of their specific benefits, you have come to the right place. Here is everything you need to know about high index lenses. “Refractive errors and lens powers required to correct them are measured in units called diopters (D). If you are mildly nearsighted, your lens prescription might say -2.00 D. If you are highly myopic, it might say -8.00 D.
If you are farsighted, you need “plus” (+) lenses, which are thicker in the center and thinner at the edge. Regular glass or plastic lenses for high amounts of nearsightedness or farsightedness can be quite thick and heavy. Fortunately, chemists have created a variety of new “high-index” plastic lens materials that bend light more efficiently. Now that we have a better idea of what high index lenses are and how they work, let’s take a look at the advantages of using them. If you are someone who requires a higher prescription, there are many benefits that switching over to a high index lens can have for you. Let’s take a look. High Index Lenses are Thinner: Due to the fact that high index lenses are more efficient in how they bend light, they are able to be manufactured to be much thinner than standard lenses. This allows for longer-lasting frames because they do not have the same stress put on them as when using regular lenses. High index lenses can be a little more costly at first, but when you consider the fact that you will not have to replace your frames as often, they actually end up being a more cost-effective investment in the long run. High Index Lenses are Lighter: It is not rocket science: less material means lighter lenses. Considering the fact that many stronger prescriptions require lenses that are heavier than the material of the frames, it is easy to see why this is a considerable benefit. High Index Lenses are More Comfortable: Considering the fact that high index lenses are thinner and lighter than regular lenses, it makes sense that they would also be more comfortable. If you are someone who requires a strong prescription, high index lenses would be a great solution for you as they will not be putting as much strain on your ears or nose. When is it a Good Idea to Go With High Index Lenses? As you are reading this, you may be thinking something along the lines of, I think I could benefit from high index lenses but I am not sure. How do I know if high index lenses are right for me? To answer this question, let’s first give a little background. We need to first take a look at how prescriptions work. When you get an eye exam, you will see the labels OS, OD and, in some cases, OU. These labels stand for left eye, right eye and both eyes, respectively. Next to these labels, you will see numbers. These numbers measure the level of correction that each eyes require in units referred to as diopters. If that number is considerably far away from 0, which is considered perfect eyesight, that means you need a strong prescription which requires a lot of material. In this case, high index lenses would be a beneficial solution for you. High index lenses are a good option for anyone with a high prescription due to the lighter material that they use. They provide a more comfortable fit and are more easily suited to the lightweight construction of most glasses frames. If you are someone who requires a stronger glasses prescription, you would do well to consider this option when it comes to purchasing your next pair of glasses. “Anti-reflective coating (also called ‘AR coating’ or ‘anti-glare coating’) improves vision, reduces eye strain and makes your eyeglasses look more attractive. As you can see, there are many benefits to using high index lenses, especially when paired with AR coating. If you have not considered using these lenses as a replacement for your heavy lenses before now, we urge you to do so. 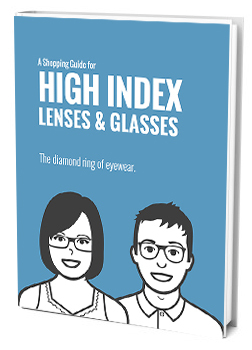 If you are interested in learning more about high index lenses be sure to check out highindexlenses.com for more information.